Mr. Ted Sarandos, Chief Content Officer for Netflix and Ambassador Avant’s spouse; Hon. T. Desmond Bannister, Minister of Education of The Bahamas; Geoffrey Canada, CEO and President of the Harlem Children’s Zone; U.S. 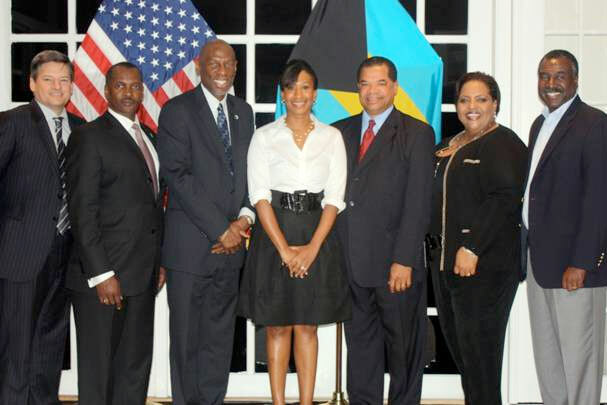 Ambassador, Her Excellency Nicole A. Avant; Sen. The Hon. Dion Foulkes, Minister of Labour and Social Development of The Bahamas; The Hon. Loretta Butler-Turner, Minister of State for Social Development of The Bahamas; and Mr. Edward Turner, Attorney-at-Law. Nassau, Bahamas - In celebration of Black History Month, United States Ambassador to The Bahamas, Her Excellency Nicole A. Avant and Mr. Ted Sarandos hosted an event in their home on February 18, in honor of American education reformer and advocate, Geoffrey Canada - President and CEO of the Harlem Children’s Zone. Leaders from The Bahamas’ public and private sectors, including representatives from the Lyford Cay Foundation and the Cape Eleuthera Institute, gathered together for a dialogue with Mr. Canada who shared insights from his work over the last two decades focused on closing the achievement gap in Harlem, New York. Bahamian government officials who participated in the dialogue included the Minister of Education, Hon. T. Desmond Bannister; Minister of Labour and Social Development, Sen. The Hon. Dion Foulkes; Minister of State for Social Development, The Hon. Loretta Butler-Turner; and Permanent Secretary in the Ministry of Education, Mrs. Elma Garraway, who presented the Vote of Thanks on behalf of the Government of the Commonwealth of The Bahamas. In her remarks, Ambassador Avant emphasized that the goal of U.S. Embassy events - such as the dialogue featuring Geoffrey Canada - is to connect technical experts from the United States with Bahamian leaders to foster future collaborations. “In the United States – much like The Bahamas – schools and communities are grappling with the challenge of ensuring that the next generation is prepared for our rapidly changing global environment…Geoffrey Canada is an innovative leader who firmly believes that all students have the right to a top education, regardless of where they live,” Ambassador Nicole Avant said. Ambassador Avant’s special guest, Mr. Geoffrey Canada, President and CEO of the Harlem Children’s Zone. 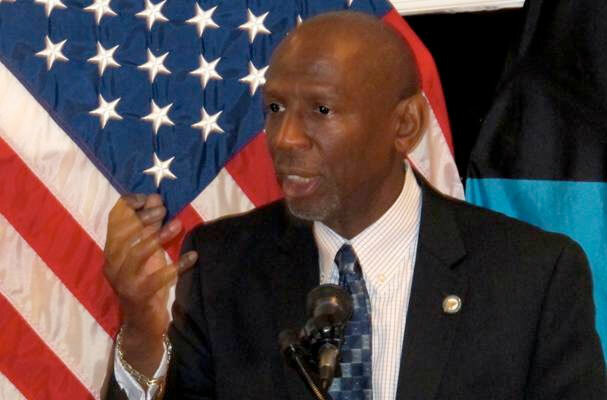 Geoffrey Canada is nationally recognized for his pioneering work helping children and families in Harlem and for being a leading voice for education reform in America. As President and CEO of the Harlem Children's Zone (HCZ) in New York City, he has dedicated the past 20 years to helping the most impoverished, at-risk youth in America obtain a top education and go on to college. The New York Times Magazine called the HCZ "one of the most ambitious social experiments of our time.” Canada was recently profiled in the 2010 film Waiting for “Superman”, directed by Davis Guggenheim who also directed the climate change documentary An Inconvenient Truth featuring former U.S. Vice President, Al Gore. Canada led the launch of the Harlem Children's Zone Project in 1997 by defining a geographic area in Central Harlem and infusing the Zone with a range of comprehensive services targeting students, their peers, and parents. Canada, who grew up in the Bronx and graduated from Harvard’s School of Education, targeted Central Harlem because it was home to the largest number of children in foster care of any place New York; the worst-performing schools; the highest incidence of children entering the criminal justice system; and one of the highest rates of children with asthma in the United States. Today, the HCZ covers 100 blocks in Harlem and aims to serve over 10,000 children this year. Canada’s strategy for reversing years of neglect and low achievement in Central Harlem is focused on the belief that in order to change the lives of inner-city kids, interventions must go beyond schools by targeting families, and the surrounding neighborhoods. Canada’s sense of urgency is based on data from the last two decades that shows a large majority of students in economically depressed areas in the United States do not receive minimal levels of instruction while in school and often graduate unprepared to compete in a “flat” global environment. “Educators need to face the fact that the old model doesn’t work. The old model wasn’t designed to prepare all students for college—a very small percentage of students were being prepared for college, and everybody else was being prepared for the factories,” Canada told the group of Bahamian leaders. In the Harlem Children’s Zone teachers are fully responsible for students’ success. Canada described the HCZ as a “no excuses” environment. The HCZ’s charter school, called the Promise Academy, commits to doing whatever it takes to ensure that its students enter and succeed in college. To fulfill that promise, students and parents must commit to longer school days and an extended school year. All Promise Academy students have access to quality health care and top performers are rewarded for their achievements. The HCZ’s ultimate goal is to break the cycle of generational poverty by ensuring its students attain rewarding careers and become valuable members of their community. Due to the HCZ’s data driven environment, researchers - including Will Dobbie and Roland G. Fryer, Jr from Harvard University - have been able to track and analyze student outcomes.Dobbie and Fryer’s April 2009 study documented the Promise Academy’s dramatic academic gains; effectively closing the black-white achievement gap in mathematics at the middle school level and in mathematics and English at the elementary school level. Their findings show that a high quality learning environment is an essential component in the Promise Academy’s success and that community investments alone cannot explain the charter school’s results. Both U.S. President Barak Obama and First Lady Michelle Obama have publically recognized Canada’s achievements and the HCZ’s holistic approach. The Obama Administration set aside $10 million in funding to establish "Promise Neighborhoods" to support cradle-to-career services in a diverse set of communities throughout the United States, including major metropolitan areas, small and medium-size cities, rural areas, and one Indian reservation.Using the HCZ as a model, on September 21, 2010, U.S. Secretary of Education Arne Duncan announced that 21 nonprofit organizations and institutions of higher education would receive one-year grants to create plans designed to improve the educational achievement and healthy development of children throughout the United States.